perennial forages, so they received no side-dressed N. We used preemergence/postmergence herbicides and hand-weeding to control weeds. 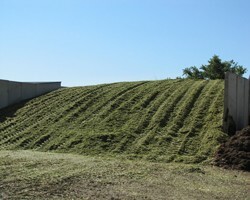 Both rows, trimmed back to an 18-foot length, were harvested for silage yield with a retrofitted 3-row New Holland Chopper with a platform and a weigh-basket, mounted on load cells. The goal was to harvest all hybrids in the 65% moisture range (plus/minus 3%), but some of the early-season hybrids were drier than planned, despite harvesting the Aurora and Harford sites in August. The Aurora site was harvested on two dates: 85-99 day RM groups on 22 August when hybrids in the three maturity groups ranged from about 62 to 65% moisture. The 96-115 day RM groups were harvested on 27 August when hybrids in the three maturity groups ranged from about 61 to 64%. We harvested all maturity groups at the Harford site on 30 August when moistures ranged from about 60% for the 84-90 RM group to about 66% for the 101-105 RM group. We harvested the Sparta Farms site in Livingston Co. on 5 September. Moisture ranged from about 60% for the 85-95 RM group and then increase by about 2 percentage points with each 5 day RM increase up to 68% moisture for the 111-115 day RM. An approximate 10,000 g well-mixed sample was originally collected from the chopper after harvest of each plot. The 10,000 g sample was then ground further in the field with a chipper-shredder. An approximate 700 g sub-sample was then weighed and recorded with a gram-scale wired to a computer in the field and refrigerated in a generator-powered freezer (samples were kept cool but not frozen). At the end of each day, the samples were brought back to a Cornell Research Farm for drying. The samples were dried at 140o F in a forced air drier to constant moisture and then weighed to determine moisture content of each sample. Dry samples were ground to pass a 1 mm screen using a Wiley mill. Samples were processed and analyzed by Cumberland Valley Analytical Services, Inc. Samples were analyzed by wet chemistry for neutral detergent fiber (NDF), according to procedures by Van Soest et al. (1991). Samples were incubated for 30 hours at 39oF in a buffered rumen fluid, according to procedures by Van Soest and Robertson (1980) using a flask system and Van Soest buffer. Following fermentation, residues were analyzed for NDF by wet chemistry to determine 30-hour NDF digestibility (NDFD). The NDF digestibility was calculated as ([1-NDF residue/initial NDF] x 100). Crude protein (CP), starch, ether extract, and ash were determined using NIRS. Milk per ton and milk per acre were then calculated using the Milk2006 spreadsheet program (Tables 2-5). Data were analyzed using the PROC GLM procedure of SAS. The LSD values for separating hybrid means were generated at the P = 0.10 level.